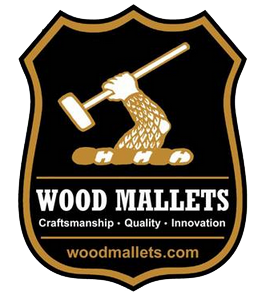 When selecting a mallet the three main options to consider are overall length and weight and type of shaft. About 60% of our customers start with a 36” mallet although taller or shorter people are advised to adjust the length accordingly. 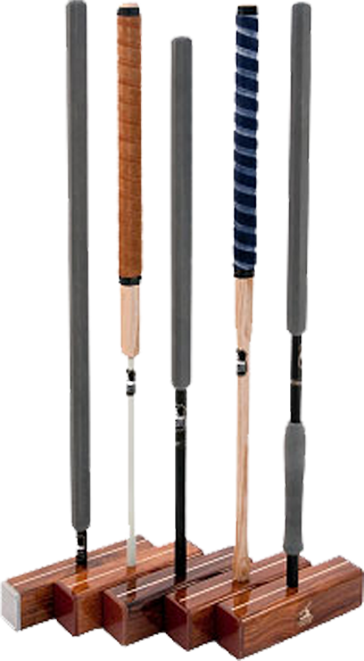 Mallets of 33” – 35” are popular at club level. Many players find that if they start with a 36” mallet, it’s relatively easy to shorten if required depending on their style and preferences. Apart from the height of a player, the ideal height of a mallet depends on what style of grip the player uses and their stance. There are three commonly used styles, the standard grip, Irish grip and Solomon grip. New players should try out different mallets and grip styles before deciding what length to order. Once you’ve established what feels comfortable for you, measure from the ground to an inch above where your top hand naturally and comfortably hold the handle. This should be the overall length. Remember, it’s easier to shorten a handle than it is to lengthen it! We can custom make handles to virtually any length. A 3.00 lb mallet is usually a good compromise and neither extreme is recommended. A heavier mallet like 3 lbs 2 oz will help for longer shots but is more difficult to control for stop shots etc. Lighter mallets of about 2 lb.14 oz can offer for more control but with less head weight the likelihood of the head twisting during the swing is higher and more effort is required for long roquets and croquets. Another important factor to bear in mind is the condition of the lawns. Obviously a lighter mallet is better on a hard and fast lawn and conversely a heavy mallet is advantageous on a slow heavy lawn. The previous recommendations assume that tournament balls weighing 1.00 lb are being used. Our standard head dimensions are 60 mm by 60 mm but the Evolution heads are slightly narrower at 55 mm wide. With regards the overall head length, 9 1/4″ used to be the default but a growing number of players are finding that 10″ and even 11″ heads are beneficial, especially with the peripherally weighted Evolution mallets . Experienced players tend to use longer heads up to 12” in length and often prefer slightly narrower heads. We’re happy to make whatever different head dimensions with an additional charge of NZ$40.00 but the Evolution mallet heads are all the same dimensions, just different lengths. We’ve used a range of grips over the years but the best grip yet is the Mazon brand used predominantly on Hockey sticks. These are extremely comfortable, lightweight, and long lasting. They’re available in a black, blue, purple, silver, lime or pink and can be purchased as spare grips in the croquet accessories section. The closed cell foam EVA grips on our new carbon handles don’t need over wraps fitted as they’re comfortable as they are. The material is light, waterproof, hard wearing and very comfortable. We make wooden, fibre glass and Carbon shafts. Turned American white ash handles are the most economical and are used by a large proportion of players worldwide. Each handle are stress tested in the workshop and great care is taken to ensure that the grain runs in line with the head. They shouldn’t break in the course of reasonable use and care. The fibre glass handles are preferred by a minority for their driving power and the fact that they’re virtually indestructible but they are heavy which is detrimental to the balance of the mallet. Our Carbon 17 mm tubular handles on the Evolution and Discovery mallets have overcome this and are considerably lighter and very strong. They’re made to a reasonably stiff flex unless otherwise requested. We do have a more flexible shaft if preferred. The long length octagonal EVA closed cell grip is the ultimate grip material being waterproof and comfortable and light. The whole handle weighs and average of just 10 ounces. The carbon shafts on the Discovery and Evolution mallets can have aluminium fittings so that heads may be removed with the use of an allen key. This is an optional extra but does however add weight to the centre of the heads which is counter productive. Our new adjustable two piece handles overcome this issue. Only recently have the rules of croquet allowed the use of metal end plates. 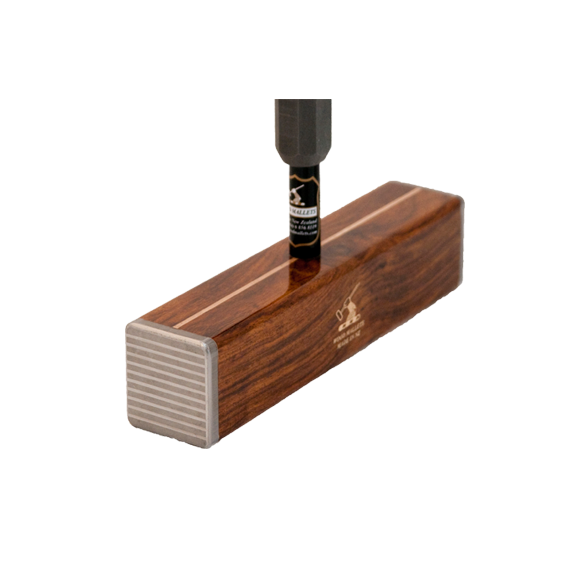 This has advanced the development and efficiency of the croquet mallet to a whole new level. By increasing the length of the head, and re-distributing some of the mass to the striking faces, the moment of inertia is increased. This makes the head more stable during the swing, particularly for making accurate rushes, long roquets, and hitting-in. Also the mallet is less likely to twist when shots are hit off-centre. It’s fair to say that this makes these type of mallets more accurate. Matched with a lightweight carbon tubular shaft and EVA grip material these make a superbly balanced mallets that provide the player with more power and yet maintain better control.